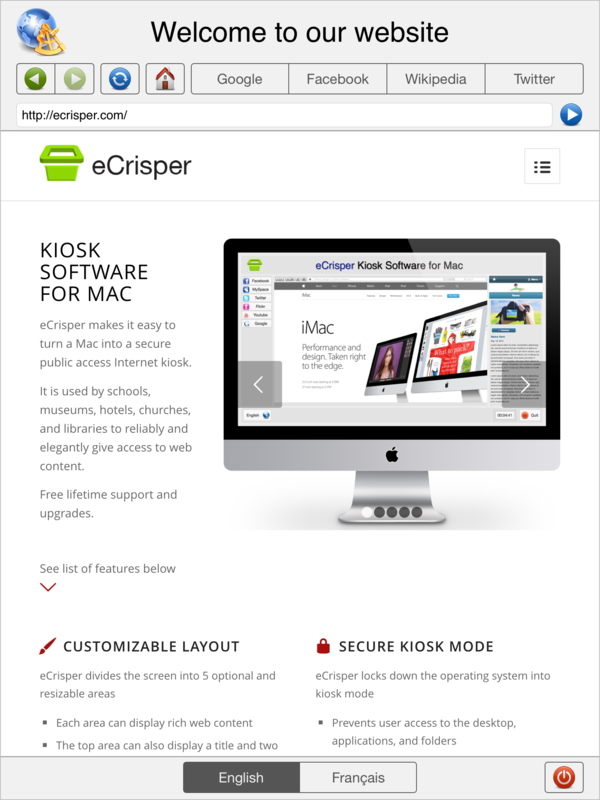 eCrisper is a fullscreen web browser designed to use an iPad as a public access Internet kiosk. A logo and a main title at the top. Navigation buttons including Back, Forward, Reload, Stop, and Home. A URL field to allow users to specify URLs to visit. A bar with up to four bookmarks. Up to four language buttons to allow users to select the language of their choice. 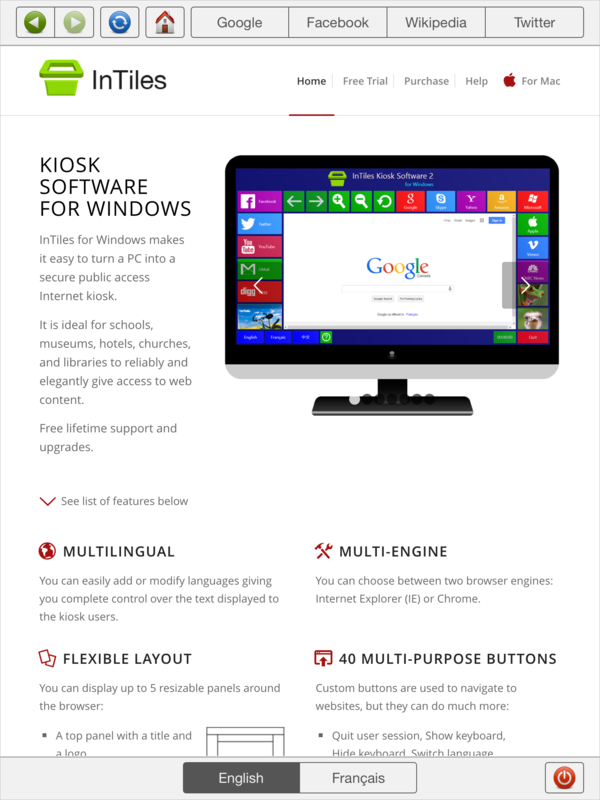 You can include up to 4 languages of your choice. The title, the home page, and the bookmarks have values specific to each language. Specify the inactivity timeout after which the home page is reloaded. Display web pages and logo stored locally on the iPad. Enable or disable the screen saver (sleep mode). Automatic Portrait or Landscape mode when rotating the iPad. To access the settings page, touch the Settings icon. On the left hand side, scroll to find eCrisper listed under the Apps column and touch to select it. 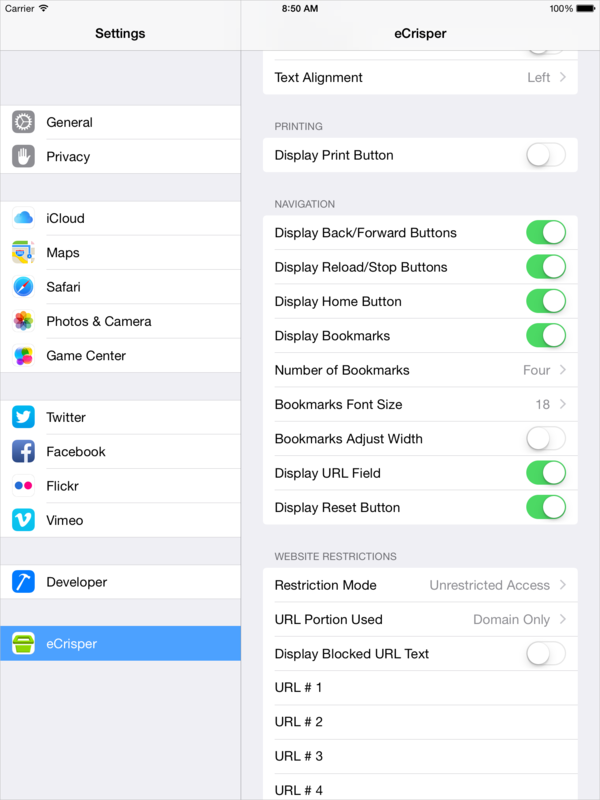 The settings available in eCrisper will be displayed on the right. Disable Sleep Mode: Set to ON if you want your screen to be on all the time. Inactivity – Reset After: If the iPad is not touched for the specified duration, it will return to the home page in the default language. Number of Languages: If it is set to a value greater than 1 then language buttons will be displayed at the bottom of the screen. Display Title: Set to ON to display a main title. A different title can be set for each language. Display Logo: Set to ON to display a logo. Logo URL: Specify either the full path of the image file or enter the name of a locally stored file. Display Print Button: Set to ON if printing is available. Display Bookmarks: Set to ON to display a bar with up to 4 bookmarks. The title and the URL for each bookmark is specific to each language. Number of Bookmarks: Select a value between 1 and 4. The bar will always use the full width available regardless of the number of bookmarks. Display URL Field: Set to ON to allow users to enter any URL. Display Reset Button: Set to ON to display a reset button at the bottom to allow users to end a session – this will delete cookies and cache. Restriction Mode: Choose one of 3 websites restriction modes: Unrestricted Access, Block Some Websites, Allow Only Some Websites. Specify part of the URL to be blocked or allowed (up to 15). URL Portion Used: Specify if you want the filter to look at the domain only or at the full URL. You do not need to enter any * to specify wild cards since the search checks if the text is included in the domain or URL. It does not look for an exact match. Languages: for each language, specify the name of the language that will appear on the language button. Also, specify the title and configure the bookmarks. 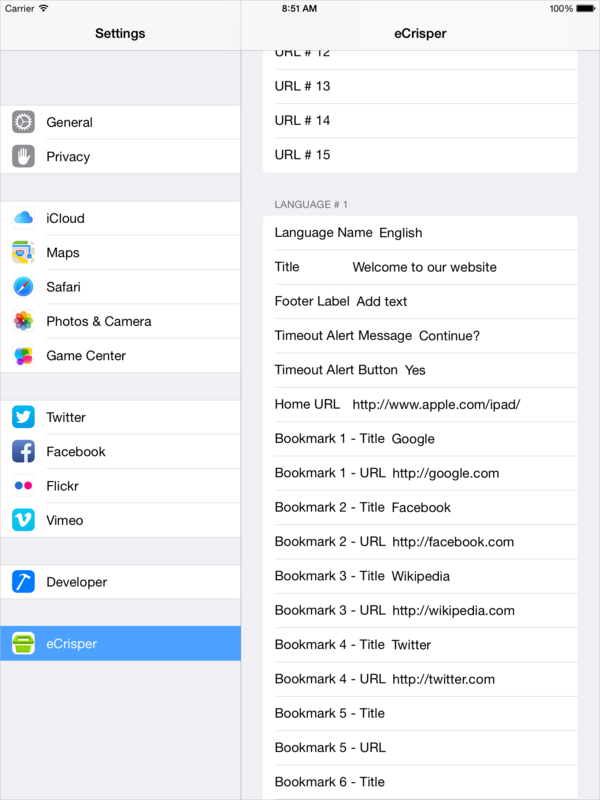 Language # 1 will be used as the default language after each user. 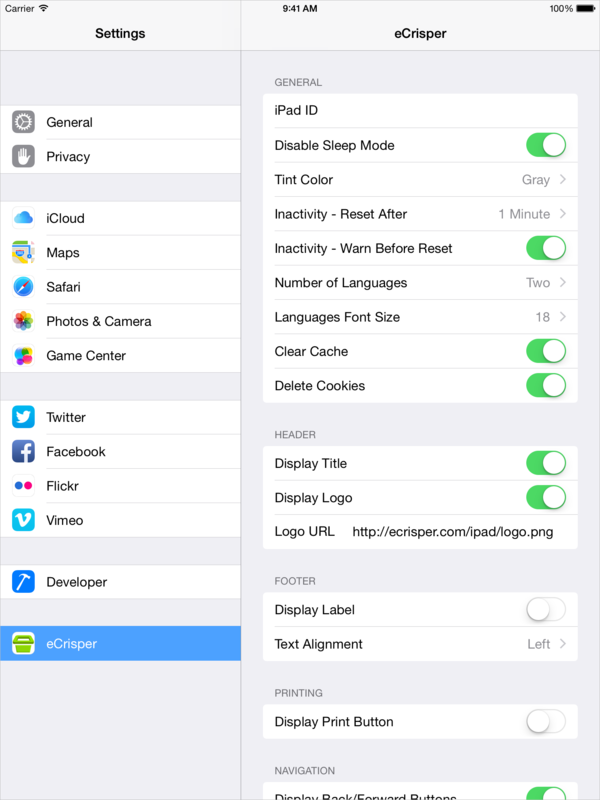 eCrisper can use files directly stored on the iPad. If you are using iTunes to transfer files, folder structures are not retained so all documents must be located in the same folder. If you wish to retain the folder structure, use a third party application such as iMazing to transfer the files. Connect the iPad to the computer and open iTunes. Go to your iPad Device on the left-hand side of the iTunes window. Click Apps (middle of top bar). Scroll down to File Sharing and use the Add button to transfer your files to the iPad. In the settings, for the URLs (Home, Bookmarks, or Logo), enter the filename Example: index.html or logo.png. If you have a subdirectory, this may be picts/logo.png.